By the grace of God, no one in the church was injured during the attack. PRAVMIR. 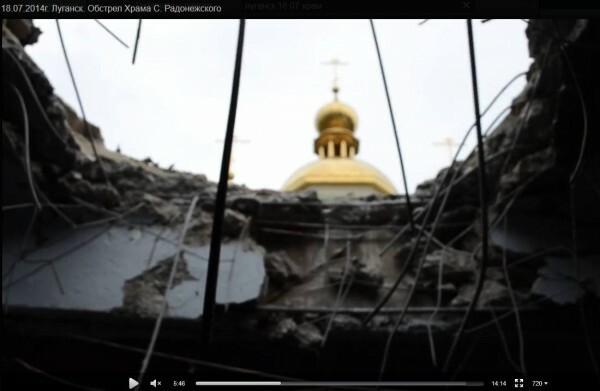 On July 18, the feast day of the finding of the relics of St. Sergius of Radonezh, a church in honor of St. Sergius of Radonezh in Lugansk on Krasnoznamennskaya Street was damaged during a church service as a result of a shell attack by the Ukrainian army. By the grace of God, no one inside the church at was injured during the attack. The exploded shell damaged only the church’s roof. “All of the faithful convey a profound prostration to the authorities for such attention. May the Lord, through the intercession of His great saint, grant health, salvation and everything that we earn according to our deeds!” it was stated.